john4jack (Corvallis, Oregon, United States) on 29 November 2009 in Transportation and Portfolio. It was a long day on the Sumpter Railway, and this has been a long series. The biggest problem with a long series is that you don't get to post the photographs that you have been taking. Enjoyed the series, Jack. As for the ones you have been taking...there is still time! ;-) Bring 'em on. This is a wonderful take! Composition, colours, all have such a painterly quality! Hope you'll post some more! @Japanalia: Thank you for this and all of your kind comments on my recent photographs. These might be miners beside a river bank panning for gold...only, here, the gold is of a different sort. This is a charming and amusing shot !!! Picture perfect. I can envision this on the front of a travel or train magazine. Certainly hails back to a more romantic time. I have really enjoyed these images and the colors on these old trains are fantastic! You are not alone at taking pictures :) Great view. @akarui: No, not alone at all. There were at least four times as many photographers as in this shot. This picture shows me a flood of passion, you and your friend's passion to the engines. I like the scenery of mountains background, too. The photographers give themselves to heart enjoyment. very beautiful. Superb hues & steam "boat"
Lovely to see all the photographers getting their shots. Its a great photo all round..as B.Thomas says above..."Bring 'Em On"! Ok now I'm just plain envious...wow extraordinaire Jack! It's been a fine and very interesting series. This one today is excellent. The stop provided such strong photographic opportunities with the steam and smoke. The train itself is so photogenic. Very beautiful serie of this old train ! Holly Smoke :))) This is a spectacle , and all these photographers there confirm that ! Wonderful picture, Jack . A complete picture of this atmosphere I can see through this shot ! Beautiful image. Once again with nice and strong colors. @Susan: Thanks, Susan. Cool stuff yesterday. This old train is really a great show to look at... and there is a lot of people to photograph it and i can understant why !! It's been a great series Jack and this particular one encapsulates everything that aficionados love about steam. That's O.K. This has been a great series. Really tells the story of the event and experience. What a great series this has been! I love the train, as well as the gorgeous scenery! @dabbler: Thank you, It would make a decent Blurb book. :-)) great composition in b&w it's make a vintage card ! Are you kidding me? I would like to go through each photographs. Each one of them is a gem and I can see them for as long as it takes. Growing up by one of the largest train yards in the USA, I've grown to love them. They are a part of me. To see how you capture their essence is just stunning. looks like a photography club for lovers of trains!!! ;) beautiful! Seems you're not alone! Wow ... so many photographers, but then it's a great scenery to capture! Beautiful photo! Great shot of the photographers, Jack. I know what you mean about posting shot series. I have such a huge backlog of shots taken during the time my mom was here for my son's wedding, and tons of shots taken afterwards, too. I guess it would help to start posting everyday, but then I'd have to write something to go with them everyday and I'm liking my break a bit too much. Anyway, well done series. 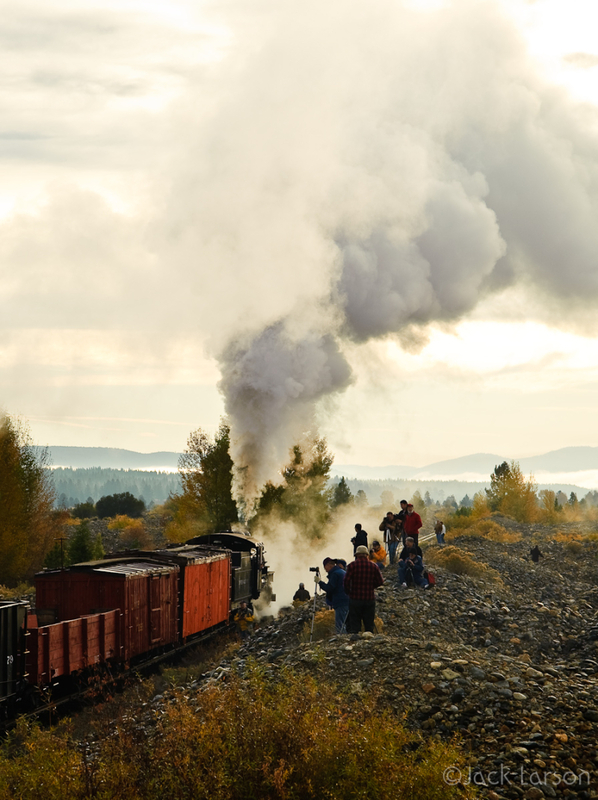 In the smoke of the locomotive will lose all the dreams of photographers. Who will succeed in captuer the best picture? l your image is sublime, Jak, it takes on the colors and reflections tawny amber fall, the color purple cars is excelente and your image is funny, full of humor. Dive and many of the 700 D, wonderful picture, congratulations a thousand times. wow.. a seriously fine photograph! .. i like the fact you included the other people/photographers in this. I like in your series that you do present the surroundings and the atmosphere on the set - this one is great, gives me a good feeling for the whole event!